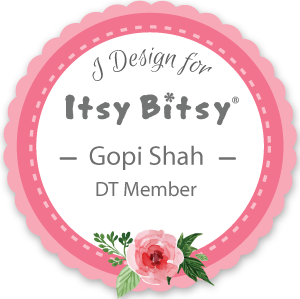 Let me welcome you all back to yet another DT tutorial on Ribbon Flowers for Itsy Bitsy. Its festive time all around the world. The time when we beautify our home to welcome our loved ones. 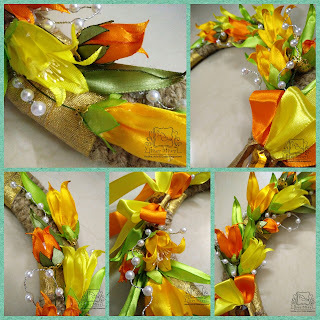 So today’s post is related to a home decor project – A floral Wreath. For the flowers, buds & leaves we would require different length ribbons from 1Inch satin ribbon pack – Citrus. Before we start with main flowers let us first prepare the various parts of it we would require. 1. To prepare pollen stems we require Flower making green stem & white glass pollen bunches. Make a small loop on one end of the green wire as shown in the picture above & use only half of the pollen bunch for one stem. 2. Gather both ends of the pollen on one side and place the looped end of the green wire between then. Now tie them with a thread to make pollen stems. 3. For the calyx, cut the shape shown in the picture above out of the mint green Ribbon. 4. Seal the edges of the calyx using a T-light candle. 5. For pearl fillers we require Flower making silver stem & white plastic pearls 6mm. Add a pearl to the wire and then twist the wire 5-6 times. Then again add a pearl and repeat. 6. Make 10-12 pearls fillers of different sizes. Make few with 4 pearls, few with 5 and some with 6 pearls. Ribbon length for the flower petals – 5.5 cms. 1. Take 2 pcs of 5.5 cms ribbon. Cut them diagonally; one of them from bottom left – top right corner & the other one from bottom right – top left corner. Refer the picture above. Out of these 4 cut pcs we can make 2 petals. Use both the ‘A’ parts to make one petal and ‘B’ part for the other. Thus to make 5 petals we will need 6 pcs of ribbon. 2. Hold both the ‘A’ pcs back to back (wrong side of the ribbon inside) and match the edges. Now using a straight tweezer hold the diagonal edges together and seal them using a T-light candle. Do not run the edge through the flame, just run it near the flame. 3. By sealing both the diagonal edges together, both the pcs are attached together to form a petal like shown in the picture above. 4. Seal the bottom edges using a T-light candle. 5. Now using a needle and thread stitch (Running stitch) the bottom edge as shown in the picture above. Pull the thread to gather the bottom and fix the thread with a knot. 6. Now holding the correct side to the candle flame, curl the top point of the petal. Hold the petal much above the flame. The ribbon will bend the moment it catches a little heat. At that point shape the petal as desired with your fingers. 7. Finally the petal will look like this. 8. Once the petals are ready, using a hot glue gun start attaching them. 9. Attach each petal only at the bottom 1/3 part. 10. Each flower is of 5 petals. 11. Glue down the 5th and the 1st petal and pass the pollen stem through the flower. Attach the stem using glue gun. 12. Add around 5-6 calyx and finally finish the flower by attaching a bead cap. We can also use a flower cap. Make around 10 – 12 flower in different colour (Light Yellow, Golden Yellow & Orange) from the ribbon pack. Ribbon length for the bud petals – 3.5 cms. Follow steps 1-7 of flower petals to make bud petals. Each bud requires 3 petals. 1. Make the centre of the bud using white plastic pearl 14mm & Flower making green stem. Attach the pearl to the wire as shown in the picture above. 2. Then using hot glue gun stick each petal to the pearl. 3. A bud is made using 3 petals. 4. Add around 6 – 8 calyx and finally finish the bud by attaching a bead cap. Ribbon length for the leaves – 7 cms. Follow steps 1-7 of flower petals to make each leaf. For the wreath we require an old carton box, burlap cord, Gesso and Golden Ribbon. 1. To make the base of the wreath, cut an old carton box to a 12” circle and then 10” circle within the bigger one. 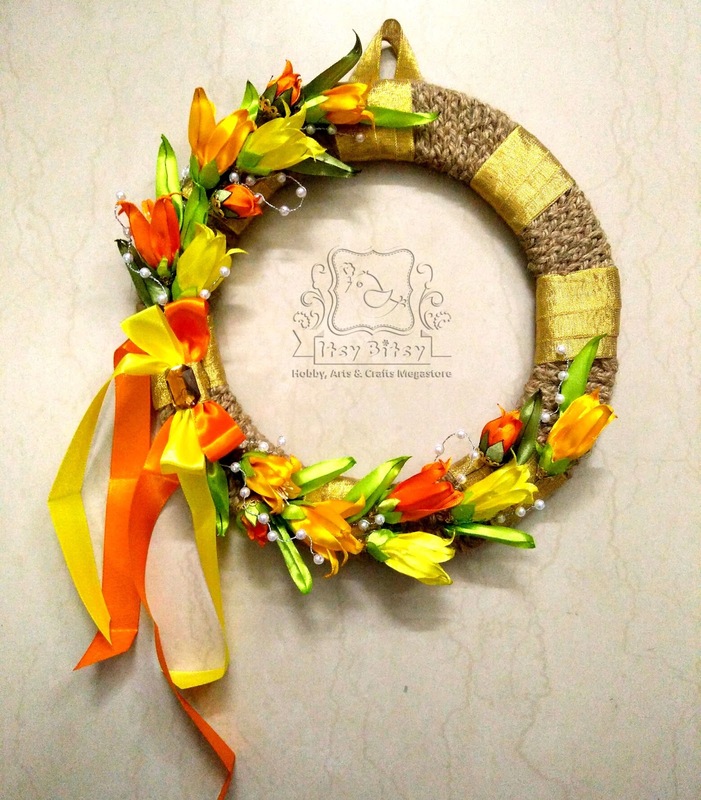 You can also use a 2mm Chipboard to make this wreath. to add more strength to the base you can double it. 2. Once the ring is ready paint the base with white gesso. 3. Now cover the wreath base with burlap cord. I had left some space at regular intervals. The burlap cord is made into a braid and then stuck to the base. This gives the cord a little volume and texture. 4. To cover up the gaps a 6mm golden tissue ribbon is required. Hope you all liked this tutorial. Do share your creations on our facebook page Itsy Bitsy Crafters Cafe with #madewithitsybitsy and leave some love below. For some more tutorials on Ribbon flowers you can check my previous post here. 1Inch satin ribbon pack – Citrus.